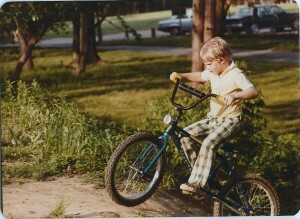 It was a Schwinn Pixie. It was manly blue. I would destroy the front fender on a parked car. Despite living on a gravel road I wore out the rear tire 7000 times faster than the front. 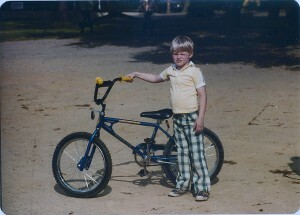 I had a BMX bike. It was a Schwinn Scrambler. 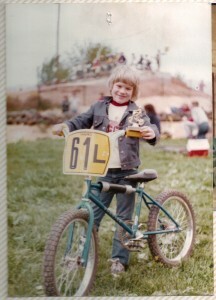 I raced it at the BMX track at Lums Pond and won a bunch of races. I rode it everywhere. I loved it. 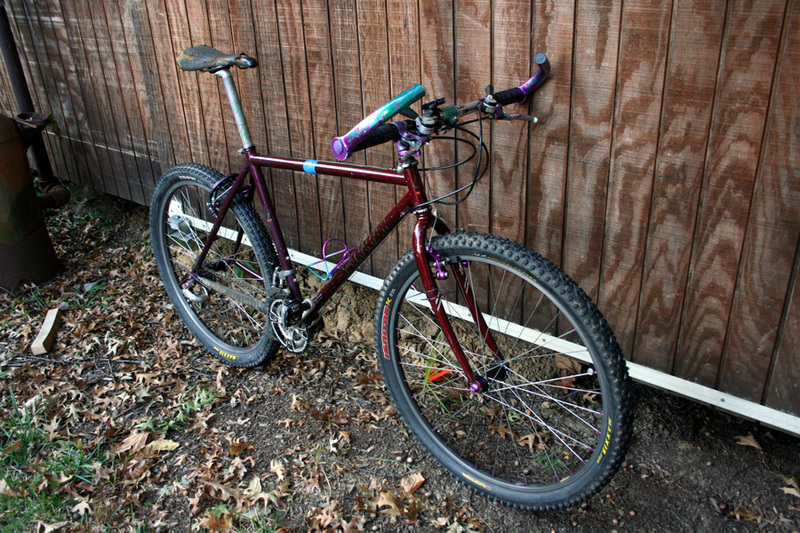 At some point I replaced it with a Schwinn Predator. 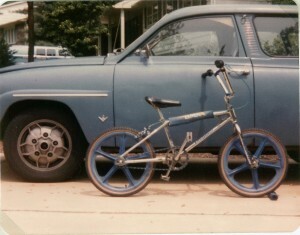 It was chrome and this might have been the beginning of my obsession with that finish. There was a Schwinn 10-speed too. 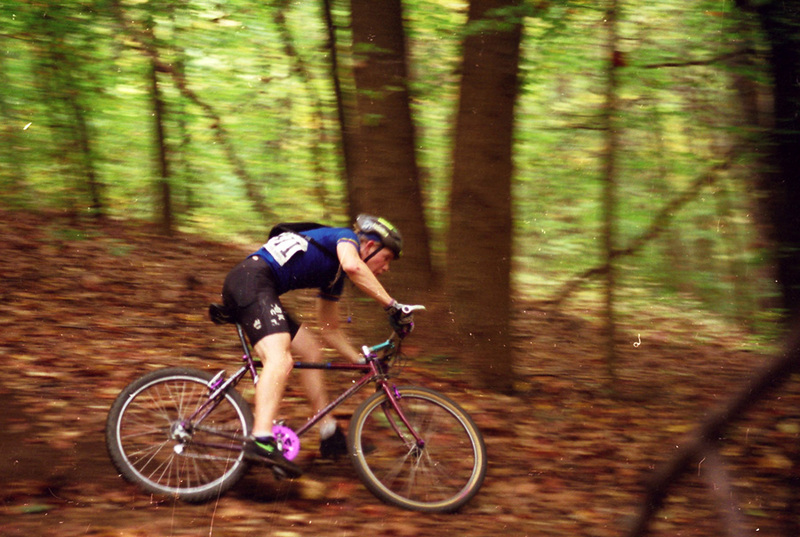 At some point I bought a used Fuji ten speed. It went fast. 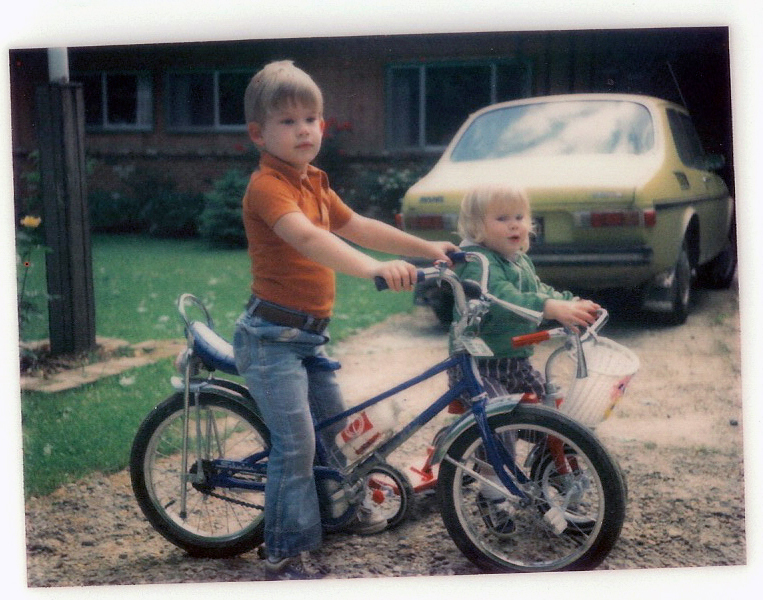 It was the first bike to take me places I’d never been in a car. I rode it everywhere. I loved it. No photo of it exists. I bought my first new bike with my own money. 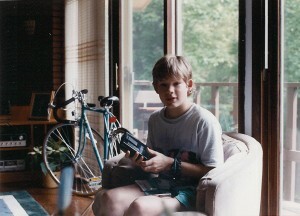 It was a Jamis Diablo, my first mountain bike. I rode it everywhere. I loved it. 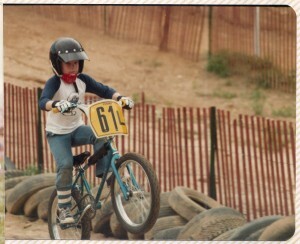 My friend Nick taught me to love bikes and ride them like never before. We rode everywhere, always. My Jamis Diablo died when I was hit by a car. I was super sad. 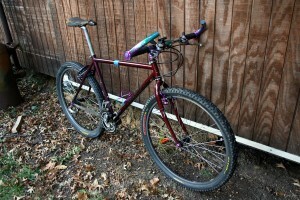 I scraped together every penny I had and bought the most beautiful mountain bike I’d ever seen. It was the last of a breed. I bought a Specialized S-Works Chro-Mo. I begged used parts off the mechanics at Wooden Wheels. I bought inexpensive components and modified them to be lighter and more like the expensive pieces I couldn’t afford. I built it into a fantastic machine and it has treated me well all these years. I raced it, and won. I rode it everywhere. Still do. I love it. Nick gave me a Cannondale Criterium road bike. We rode everywhere. I loved it. I had to get a job. I didn’t ride. We moved to Blacksburg, VA and I did some hiking, but no riding. Then one day my friend Craig asked me if I’d like to do a Century with him. “What’s that?” I asked. “A 100 mile bike ride” he said. I explained that I hadn’t ridden in years but sure “sounds like fun”. I enjoyed the ride and finished strong. When I got home, I nearly passed out in the grass in my back yard while my dog licked my face. I loved it. I lost my job. Every morning I didn’t have a job I rode 50 miles. I loved it. Who wants a job? I had a job. I worked but didn’t ride. 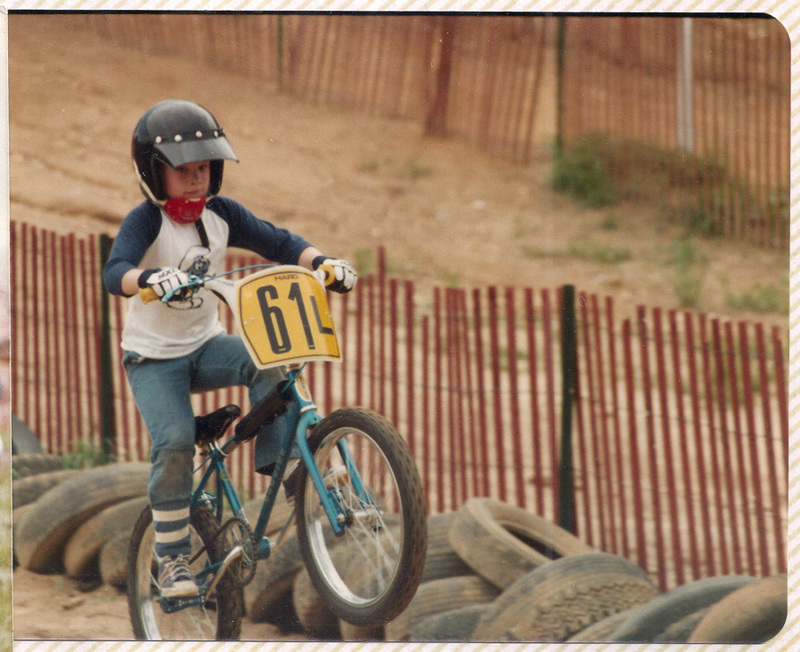 Then one day in 2009 my neighbor Mark told me he had an old Italian steel racing frame in his garage. I bought it 20 minutes later. I built it with inexpensive Campagnolo parts I got from Ebay and with borrowed wheels from my friend Chris with whom I was just reconnecting. I rode it and loved it. I wanted to upgrade the Daccordi so I started asking around for some better parts. My friend Chip sold me a De Rosa that was his fathers. It came with C-Record parts I was planning to put on the Daccordi but when I saw the De Rosa, I couldn’t bear to part it out. I rode the De Rosa in the 2010 Mountains of Misery. It was the greatest physical challenge of my life, but I finished. I loved it. I keep going back every year. That De Rosa started something. I was entranced by its abilities. It so inspired my friend Chris that he went on a quest to find his own, which he did, twice. Suddenly I have a friend with whom I ride and share my passion for collecting and restoring classic bikes.